Start-up company 247 Korea announced Monday that it would be launching a self-defense smartphone case through crowdfunding site Kickstarter in July. If the launch via Kickstarter is successful, the company plans to pitch its product on Indiegogo, another crowdfunding site, as well. Intended to serve as a means of self-defense, the smartphone case developed and produced by 247 Korea is equipped with a Taser-like stun gun that extends from the case upon the recognition of the user’s fingerprint via a mobile app. Despite its small size, the device is capable of producing a strong electric current of 30,000 to 50,000 volts. In conjunction with the activation of the stun gun, family and friends whose phone numbers are entered into the app in advance are notified of the emergency situation and the location, based on which the police can be dispatched to provide assistance. The video and audio recording features of the phone are also activated to provide evidence of any crime. 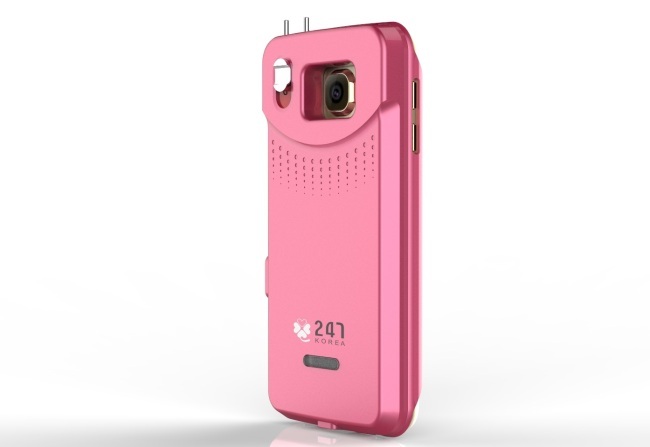 Both IoT and big data technology were applied to the development of this product, and during development the thickness of the case was reduced from 2 centimeters to 0.8 centimeters and a strong, durable stun gun cover was added. The case also contains a battery designed specifically for it. It is illegal for civilians to carry a stun gun in Korea, but the company is optimistic about the prospects of selling the product overseas. “Many people showed great interest in our product at the France-Korea Business Partnership event held in Paris earlier this month, including German buyers and the vice-mayor of Paris,” 247 Korea CEO Lee Hwa-jung said. Orange currently operates Orange Fab, an accelerator program that helps startups enter the global market. 247 Korea says the self-defense smartphone case is designed for those most at risk of violence in society, including women, children and people with disabilities. The “247” in the company’s name, which means that the company strives to ensure the safety of its customers 24 hours a day, seven days a week, is indicative of this. “We will be developing and releasing special tasers for general users as well as ones specifically for wheelchair users,” Lee said. The Gyeonggi Center for Creative Economy & Innovation is currently supporting 247 Korea’s efforts to debut in overseas markets.